Teeth in the human mouth are incredibly strong and resilient. Without the proper care, though, the protective coating of enamel on the outside might start to wear down, which leaves the teeth susceptible to decay. Use these tips to try to prevent decay and keep your mouth as healthy as possible. One of your best defenses against decay is your cleaning routine. You should make an effort to brush your teeth for at least two minutes at a time twice a day every day. Use a soft-bristled toothbrush that allows you to clean out your mouth without brushing too hard. You should also floss once a day to dislodge and food, plaque, or bacteria that might be stuck between your teeth and your gums. Even if you are diligent about brushing and flossing your teeth, it is still important to visit the dentist once every six months. The oral health professional has the tools to give you a deeper cleaning that lowers your risk for tooth decay and the problems it causes. Keeping up with your dental appointments is an important element of maintaining a healthy and beautiful smile. Certain foods make it more difficult to keep your mouth clean. 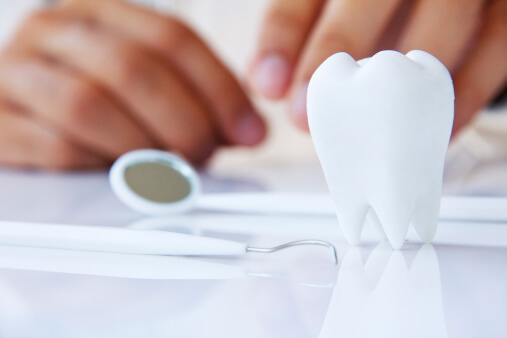 If you eat a lot of sugar, carbohydrates, or acidic foods, these ingredients can coat the teeth and give bacteria the fuel they need to create plaque and wear down the teeth. Try to eat more leafy greens, lean proteins, and healthy fats to improve your oral and your overall health. With the preventative services at the dental office of Dr. John Carson, we can help you avoid decay and periodontal disease. We use the best technology to ensure that you always have the treatments you need. To learn more about our services or to schedule your next cleaning, visit us online or call (520) 514-7203. When you properly care for your dental implants, they should last for a lifetime. If your dentist wants to use implants to replace one or more missing teeth, it is important to learn how to properly care for them to keep them in top condition. Use this guide for help taking care of your implants. Although dental implants are not susceptible to cavities like your natural teeth, your gums are still vulnerable to periodontal disease. If you want to get the most use out of your implants, you should brush your teeth twice a day with a soft-bristled toothbrush and floss once a day. Cleaning out food, plaque, and bacteria gives you control over your oral health and helps you maintain your dental implants so they continue to work for you. 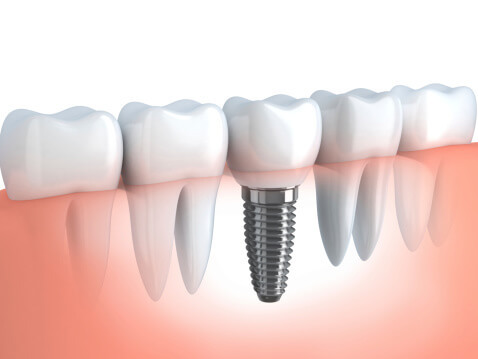 When you have dental implants, it is more important than ever to keep up with your regular dental visits. The dentist will want to examine your mouth after the implant procedure to ensure that everything is healing correctly. If you visit once every six months, he or she can also give you a deeper cleaning and check on the surrounding teeth and gums to make sure everything is functioning as it should. The foods you eat play a huge role in your overall oral health. If you want to maintain strong gums that keep your dental implants in place, it is important to eat a healthy diet. Avoid foods with a lot of sugar and acids to keep the surrounding teeth and gums in top condition. Try to eat crunchy fruits and vegetables to enhance your cleaning efforts and avoid hard candies. With the help of Dr. John Carson, you can get dental implants that replace your missing teeth and help figuring out the best way to care for them. Call (520) 514-7203 today to learn more about our general, preventative, restorative, and cosmetic dentistry services or to schedule your next appointment. Sensitive teeth make it difficult to eat or drink certain foods and beverages. If you have sensitive teeth, use the following tips to care for them to minimize your discomfort and restore the full use of your mouth. It is still important to brush your teeth twice a day even when you are having sensitivity issues. Switching to desensitizing toothpaste can help to relieve some of your discomfort. These toothpastes are designed to fill up the holes in the dentin that are causing the sensitivity. If you are having a lot of problems, you might want to apply the toothpaste to the most sensitive areas with your finger and leave it on while you sleep. Sensitive teeth are often a side effect of using tobacco products. If you smoke, chew tobacco, or use snuff, you should make an effort to stop to give your teeth the chance to heal. These tobacco products can also make your gums recede and increase your risk for oral cancer. The more plaque that exists on your teeth, the more issues you will have with sensitivity. Keeping your teeth clean gets rid of these bacteria and gives your mouth the chance to heal. You should use a soft-bristled toothbrush that will not irritate your teeth or gums any further. If you are still having problems with sensitivity after you try these home remedies, it is time to visit the dentist. Your oral health professional can examine your mouth to determine the best way to treat the issue and alleviate your discomfort. 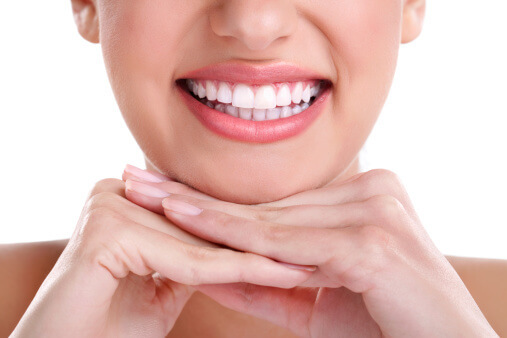 Whether you are having problems with sensitive teeth or you want to learn more about certain cosmetic dentistry procedures, the dental office of Dr. John Carson has what you need to get a smile you love. 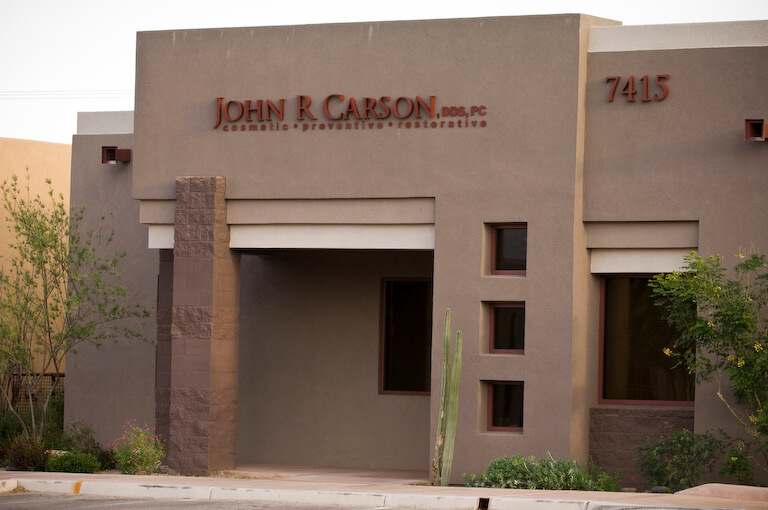 As one of Tucson’s top dentists, Dr. Carson is dedicated to giving his patients the best care. Call (520) 514-7203 to learn more. Gums keep your teeth in place and help them stay strong and healthy. If periodontal disease starts to attack your gums, however, it can lead to major problems for your mouth. Various stages of gum disease create different symptoms. Use this guide to learn more about these signs so you know when you should visit a Tucson dentist for periodontal treatment. The first stage of periodontal disease is known as gingivitis. This occurs when bacteria and plaque build up along the gum line, which causes inflammation. If there is too much plaque to remove with your normal cleaning routine, it will cause your gums to bleed, swell, or turn red. If you catch gingivitis early enough and visit your dentist for treatment, this condition can still be reversed. Without the proper treatment, gingivitis eventually attacks the bone and fibers that keep your teeth in their proper location. Once they are damaged, you cannot reverse the damage. This stage of gum disease is known as periodontitis and often causes pockets along and below the gum line. These pockets leave plenty of room for food to buildup and more plaque to develop, which will make the problem even worse. With the help of your dentist, you can learn about better ways to care for your mouth to prevent your gum disease from worsening. If you do not work with your dentist after you have periodontitis, you might be at risk for advanced periodontitis. If you reach this severe stage of gum disease, the bacteria in your mouth start to destroy the fibers and bones that keep your teeth in place. This might eventually lead to tooth loss. Scheduling regular visits with Dr. John Carson can help you prevent any stage of periodontal disease. Our state-of-the-art office has all of the tools to give you the proper treatment every time. To learn more about our services and periodontal treatment, visit us online or call (520) 514-7203. The pulp lies at the center of the tooth and houses all of its nerves. If decay or an infection makes its way down to the pulp, your Tucson dentist might suggest a root canal. Keep reading to learn the answers to some of the most frequently asked questions about root canal therapy. How Can I Tell I Need a Root Canal? You might need a root canal if you have severe pain when you chew or put pressure on a certain part of the mouth. Excessive sensitivity to hot and cold temperatures could also be an indication that there is an issue with your pulp. Sometimes the tooth gets discolored and the nearby gums start to swell. Some patients do not have any symptoms. The dentist will first take an X-ray of your mouth to get a closer look at the tooth and the damage in the pulp. As long as there is no presence of infection in the nearby bone, the dentist will then numb the area before drilling a very small hole in the tooth. He or she then removes the pulp, the tissue, and any debris through this hole. Once the area is completely cleaned out, the dentist can seal the tooth. Although there is a stigma that root canal therapy is painful, the procedure often causes no more discomfort than getting a cavity filled. When the pulp is damaged or infected, it usually causes a lot of pain in the mouth than the treatment. Root canal therapy relieves this pain. Some patients experience sensitivity for a few days after the treatment, but over-the-counter or prescription medication should help with that. Whether you need root canal therapy or a general checkup, Dr. John Carson, DDS is one of Tucson’s top dentists. With his dedication to his patients, Dr. Carson promises to offer the best treatment at every visit. To learn more about the office or to schedule your next appointment, visit us online or call (520) 514-7203. TMJ disorders can lead to pain or clicking in the jaw and might even cause headaches. If your dentist has told you that you have a TMJ disorder, it is important to learn as much about it as you can. Keep reading to find out the answers to some of the most common questions about these oral problems. Your jaw is made up of a series of muscles and joints that are designed to work together to allow you to open and close your jaw. If you have any myofascial pain or discomfort in the muscles surrounding the jaw, it is because of a TMJ disorder. You might also have a displaced disc, a dislocated jaw, or another injury that keeps the TMJ from functioning as it should. 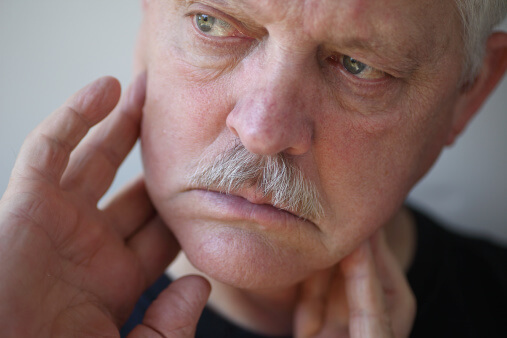 TMJ disorders can also be the result of arthritis in the joint. Why Do TMJ Disorders Happen? Unfortunately, science has not yet discovered a specific cause for TMJ disorders. Trauma, a misaligned bite, and even hormones could affect a person’s TMJ and might eventually cause a disorder. If you experience any pain or discomfort in these areas, you should go in to see your dentist as soon as possible. Dentists usually start off with conservative treatments to see if they can get rid of the symptoms of the TMJ disorders. Your dentist might suggest that you only eat soft foods, that you use ice packs to alleviate pain, and that you try not to move your jaw too much until your symptoms go away. If none of these treatments work, though, he or she might suggest a more aggressive treatment such as splint therapy. John Carson, DDS is one of Tucson’s top TMJ dentists. If you are having problems with your jaw, Dr. Carson can help you find the best way to fix it. To learn more about his services or the office, check out our website or call (520) 514-7203.